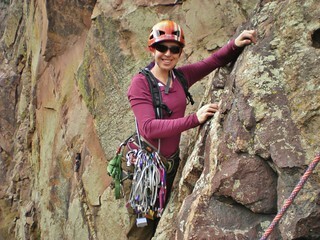 On Saturday, I led a rock climbing trip as part of the CMC Climber’s Festival. I led Breezy and then Wind Ridge. 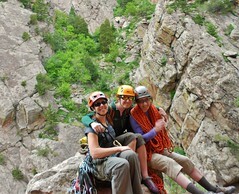 Rick was my co-leader and he led Breezy and then meandered over to some other moderates on the wall. 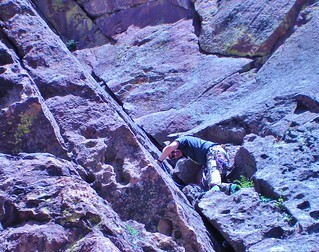 In the afternoon, Rick led a separate trip to top rope the routes at Supremacy Slab while Erin, Ilene, and I chilled at the Eldorado Canyon Visitor’s Center. We waited patiently for the bbq celebration to start. We were thrilled when we walked around back and saw coolers with Beer and Food! Yay! Chris got started on bratwurst right away while I cooked up the hot dogs. 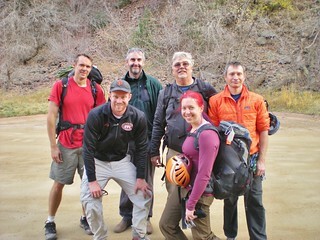 Jeffrey and Rick were the next to show up, followed by Brenda, Wayne and Susan, Slava, and the rest of the Boulder gang. 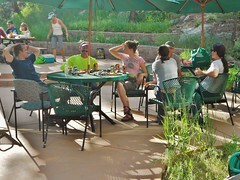 We had a lovely afternoon hanging out on the patio (so nicely supplied by the Eldorado State Park people), telling climbing stories, and talking about climbing. 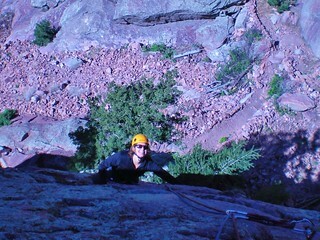 Excited to climb Wind Ridge! 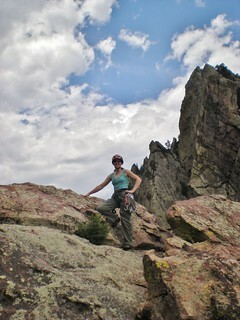 Kimberly Climbing Wind Ridge-She Rocked it, Big Time! 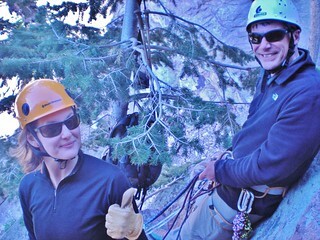 Today, I took two of my students, Kimberly and David, on their graduation climb. Kimberly and I did Wind Ridge and then we headed over to Whales Tail. It was a nice day for climbing and we all learned some lessons. For example, I learned of a better spot to put my first anchor on Wind Ridge. I had been placing it on the slab, just over the edge, but from now on, I will place it in the crack, out on the face! 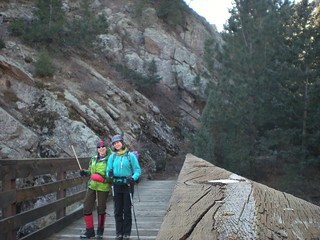 Erin and I hiked from the Ranger Station in Eldorado Canyon, over to Walker Ranch. We then hiked the loop, and came back. It was a wintry day, but still a pleasant jaunt. 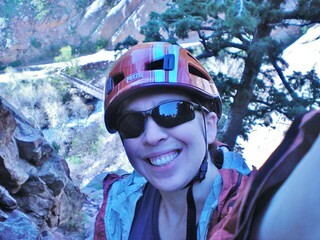 We had fabulous views of Eldorado Canyon and did a tiny bit of off trail wandering, which was fun. Left to Right: Chad, Chris, Andy, David, and Slava. Leader Clare in Front! 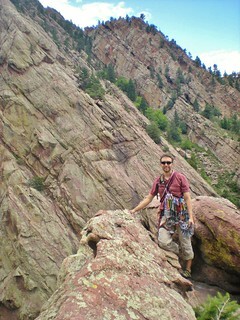 I led a CMC trip to the Whale’s Tail rock formation in Eldorado Canyon. It was a chilly fall day, but with very little wind, we’d have a super time. The Whale’s Tail formation is a good place to take a small group of people; I found that no more than 6 people is really the ideal group size. I have climbed a bunch at Whale’s Tail, so none of the routes were new. However, Slava and I did have a good deal of fun climbing the center route in our approach shoes (on top rope, of course!). On Sunday, Doug and I climbed The Bastille (5.7+). Doug led the odd pitches and I led the even ones. When we arrived, there was a party of multiple people who were on it and a couple parties of two in front of us. We were surprised because we got there very early in the morning. Apparently, not early enough!